← Dark Angel (Her Angel: Bound Warriors Paranormal Romance Series Book 1) is out now! Did she affect him at all? Her pulse raced faster and she struggled to breathe evenly as she neared him. They must have talked for hours in the years they had known each other, had shared secrets and laughs about all manner of things, but she still had to drag her courage up from her toes whenever she wanted to speak with him. She nodded when an elderly man wished her a good night, offering him a warm smile that came straight from her heart. She had known him since she was a kid, back when her parents had run the old bar that was now hers and she had been more interested in running around and talking to all the regulars, showing them her latest paintings or hearing their stories. Annelie glanced around to make sure that no one needed her. The pub was quieter now that it was approaching closing time. A few regulars remained along with a group of people she didn’t recognise who were sitting in the corner near the bay windows that overlooked the road. She could finally speak to Lukas without interruption. She sucked down a quiet breath. Leaned on the damp bar opposite Lukas, between two sets of pumps. Reached a trembling hand out and swept his fair hair out of his eyes. He leaned away, almost fell off his stool, clutched the brass rail that ran around the edge of the bar to stop himself, and then looked at her. An all-too-familiar jolt shot through her when his clear green eyes met her brown ones and her heart fluttered in her chest when he smiled lopsidedly. “You okay?” She went to take her hand away but he took hold of it, bringing it down to the bar. She swallowed hard as he toyed with her fingers, his warm and firm against them, and her heart thundered, hammering against her chest as her mouth dried out. His gaze fell to their joined hands, a flicker of fascination entering his eyes, and she told herself not to read into it. So what if this was the first bordering-on-intimate contact they’d had? So what if he had made her heart stop the moment he had first walked into her pub three years ago and it had stopped every time she had seen him since? At least, it didn’t mean anything to him. He had gone away for three long weeks without a word, leaving her wondering if something terrible had happened to him. And then the moment he walked back into her life, he hit the drink. Lukas didn’t answer her. His green gaze remained fixed on her hand and he turned it this way and that, his touch gentle now. Her heart whispered that this was interest beyond friendship. She tried to shut it up but it persisted, filled her head with the ridiculous thought that she might finally get her wish, that those dreams she had of Lukas were finally going to become real. Annelie shut it down, because disappointment and heartache lay down that road. Lukas was just drunk, tired and, by the looks of things, a little out of sorts. For the first time, he looked as if he was the one who needed to unburden his shoulders and his heart, and she was determined to listen to him as he had listened to her so many times in the past. She was going to help him. It was the least she could do for him. Someone stepped up to the bar at the far end and she waved to Andy to serve him. She couldn’t leave Lukas until she knew what was going on in his head and why he was suddenly drinking, or at least until she was sure he wasn’t about to fall off his stool and hurt himself. Annelie bent lower so she could see his face. His gaze finally left her hand and met hers again, bright in the lights from the mirrored cabinet of bottles behind her. “I said you okay?” She searched his eyes. His pupils were wide as he raked his gaze down over her chest, fire following in its wake, and then lifted it back up to her face. It remained fixed there and a blush crept onto her cheeks as he studied her, the intensity and sudden sharpness of his eyes holding her captive even when she wanted to glance away and avoid his gaze. He had never looked at her so closely, or with so much banked heat in his eyes. Heat that rippled through her and had her deeply aware of the way his hand held hers and how close she was to him. “Hell of a week.” His reply was so quiet that she barely heard him. “You’ve been gone three.” Those words slipped from her lips before she could stop them, laced with hurt that surprised her, had her reeling a little as she stared at him and felt the heavy press of that pain on her heart. She had thought she had been worried about Lukas when he had disappeared on her, but now she realised it had hurt her too. She had been afraid she would never see him again. Annelie nodded. Lukas released her hand and she mourned the loss of contact, ached for him to touch her again, to hold her because it had been reassuring her that he was back with her now. He heaved a long sigh and ran his hand over the messy finger-length strands of his hair, preening it back, before pinching the bridge of his nose. His eyes screwed shut. “Hell of a three weeks.” Lukas smiled but she saw straight through it. “Annelie,” Andy called but she waved him away again. Andy had been tending bar long enough to handle problems on his own now. Lukas needed to talk. She had seen it the moment he had sat down tonight, but the pub had been so busy that she hadn’t been able to talk to him other than taking his order. He had never really spoken much about himself and the one time he needed to, she hadn’t made time for him. He had always made time to listen to her. What sort of friend was she? “I was wondering where you were.” Her tone was jest but her heart meant the words, ached a little as the last three weeks caught up with her together with the revelation that she had been afraid of never seeing him again. Lukas’s eyes lifted back to meet hers, and she told herself not to read into the look that crossed his handsome face, because there was a chance she was misinterpreting it or just seeing what she wanted to see—that he was pleased to hear she had missed him, had been thinking about him. She never had been able to place his accent. It wasn’t British like hers and most of the people who frequented the pub. She had asked him about it once and he had simply said that he had lived in many places. She had told him her whole life story and he hadn’t even told her where he was from. If she asked again, would he tell her? If she didn’t give up this time and tried to peel back his layers to learn more about him, would he answer all her questions? She had never pressed him before, had secretly enjoyed the air of mystery that surrounded him, but now things were different. He had gone away, and had returned a different man, and she wanted to know where he had been, what he had done, and why he had disappeared. She wanted to know everything about him. “Well, I can’t let you drink and fly.” She couldn’t contain the laugh that bubbled up, shook her head for a different reason as she looked at him. “I’ll give you a lift if you wait until we’ve closed.” Hopefully he would have sobered up a little by then and could direct her to his place. She had never seen him outside work before and didn’t have a clue about where he lived. She thought she remembered him mentioning it was in the city, somewhere close to the heart of London, but she couldn’t be sure. Lukas stared into her eyes for what felt like hours and then nodded. Annelie took her hand back and smiled, relief flowing through her. It was better he didn’t go home alone, in a cab or on the bus. She would only end up worrying that he had gotten into trouble somewhere. While she was driving him, she was going to get him to talk to her. She was going to find out where he had gone and why he was suddenly drinking. She was going to ease the weight on his shoulders just as he had done for her so many times in the past. Closing time was only twenty minutes away, but it would be at least another hour before she had finished cleaning up, counting the takings and getting everything ready for tomorrow. She glanced back at Lukas and debated making him a coffee to help him sober up. He rested his arm on the counter and used it as a pillow, his eyes closing again. Sleep would probably help him as much as caffeine. He had looked tired before he had started drinking, worn down and in need of a good night’s rest. She turned towards the rows of bottles and optics and turned off the sound system, so only the chatter of the other patrons filled the pub. Hopefully the hum of voices wouldn’t disturb Lukas. Annelie flinched when Andy called for last orders, his voice loud enough to wake the neighbourhood, and scowled at him. He gave her a blank look. She jerked her chin towards Lukas where he was sleeping, and Andy’s dark eyebrows lifted as his gaze shifted to him and then a mischievous smile lit his face as he looked back at her. “He sleeping over?” Andy parked his hip against the bar near her as she served a customer. He didn’t look as if he believed her. “Just serve the customers.” She shoved him playfully in his chest and he winked and went to work. Her gaze crept back to Lukas, heart fluttering in her throat as she thought about driving him home and the way he had held her hand, had played with her fingers and had looked at her with a wicked edge to his eyes, a flare of desire that echoed inside her. Did he want her, or was it just the booze talking? She barely noticed the pub emptying, was too swept up in her thoughts to say goodbye to everyone as she got a head start on cleaning up. He moved out from behind the bar, grabbed his coat and stopped behind Lukas. She scowled at Andy when he clutched his hands together in front of his chest, twisted back and forth at the waist and fluttered his eyelashes as if he was swooning over Lukas. “Get out of here before I fire your arse.” She lifted her own towel, scrunched it up in her hand and threatened to throw it at him. She shook her head. There wasn’t much Andy wouldn’t do. The door closed and she shifted her focus to Lukas where he leaned over the bar, sound asleep. Her pulse thrummed, steadily picking up pace as she gazed at him and grew aware of the fact she was alone with him now. Damn, he was gorgeous even when he was drunk, drew her to him like no other man had before him. She shook herself out of her reverie, tied her long red hair back into a ponytail and wiped the bar down, doing her best not to disturb Lukas and trying to avoid looking at him. She found herself stood by him, looking down at his face, watching him sleep. A need poured through her, swirled and gained strength, until she couldn’t resist it. She hesitated and then, with her heart in her mouth, brushed the tangled strands of his fair hair from his forehead. His firm lips parted and he murmured something. She smiled and brushed his skin again, lightly so he wouldn’t wake, but enough contact to make her feel a little giddy. When had she fallen for him? It had come on so slowly over the past three years that she hadn’t realised she had those sorts of feelings for Lukas until he had gone away, and then she had been worried that he wasn’t coming back. But here he was again, at her bar in the same stool he always occupied, bringing light into her life and her heart in that way only he could, making the days without him disappear. A smile tugged at her lips. She had never been happier to see him. Annelie didn’t take her hand back. She was feeling brave tonight, a little courageous and bold, willing to take a risk and see what happened. “How are you feeling?” She combed her fingers through his hair. “No better yet?” Her gaze followed her fingers as she stroked them down the curve of his left ear. He nodded, moving her hand with him, and a smile touched his lips and then faded again when he closed his eyes. “I’m almost done. I’ll have you home soon.” She went to walk away. He caught her wrist so fast that it startled her, his grip firm as he sat up, and looked at her with such earnest eyes that her heart beat harder and a rush of nerves surged through her. “I ever tell you that you’re pretty?” Those words, spoken in a low husky voice, rocked her to her core. Her pulse raced and her throat turned dry. She shook her head and he reached out with his other hand and ran the backs of his fingers down her cheek, his caress light but setting her nerve-endings aflame and sending a hot shiver over her skin. Her lips parted as she searched his eyes, trying to see if he knew what he was saying, and whether he believed she was pretty. There was nothing but honesty and warmth in them. Annelie tried to convince herself that it was the drink talking but failed dismally. She had worked in the pub since she was in her early twenties, almost ten years ago, and had run it since her parents had retired early. She had enough experience to spot levels of inebriation. Lukas’s eyes were sharper and his words weren’t slurred. He wasn’t drunk anymore. He was definitely still tipsy, but that excuse didn’t hold with her heart. He really did think that she was beautiful. She blushed. It burned her cheeks before she could get the better of herself. She worked at a bar. She was used to men telling her that she was beautiful at the end of the night, but the way Lukas said it, the fact that it was him, made her believe him. Annelie looked deep into his eyes, lost in them and the way the flecks of pale gold seemed to shift and move against their emerald backdrop, and blinked slowly. “Mmm, that’s more like it.” He pulled her closer and tilted his head. Her gaze dropped to his mouth, heart hammering against her ribs and blood thundering as a need to kiss him bolted through her, lighting her up inside, making her sway towards him. 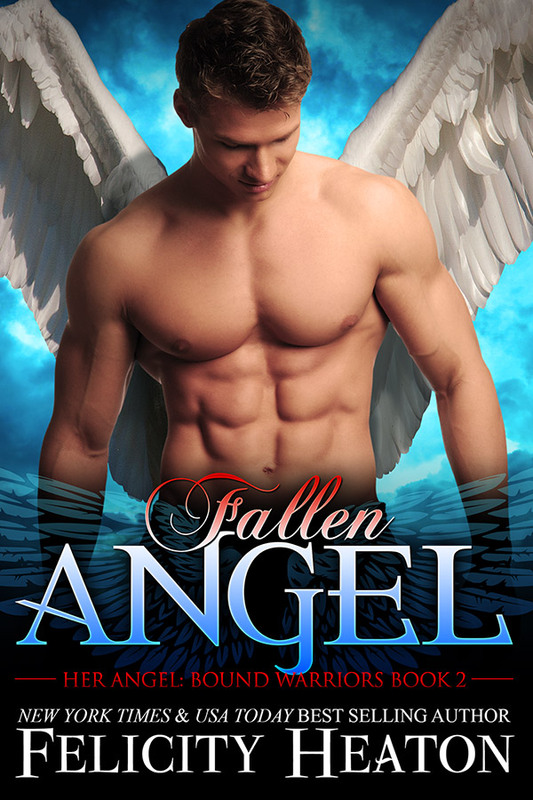 This entry was posted in 2018 releases, angel romance, Fallen Angel, Her Angel: Bound Warriors, new release, paranormal romance, witches. Bookmark the permalink.